Leading Manufacturer & Supplier of CNC Machined, Precision Optical Components & Optical Parts. We understand the unique manufacturing constraints involved with the optical industry. The immensely small tolerances and impeccable quality control standards required by the optics industry often constrain optical product manufacturers; however, our state-of-the-art optical parts Swiss-style lathing job shop is more than prepared. Our customers that utilize our company can feel at ease knowing our Swiss style optical part manufacturing service enables us to turn most any optical part design concept into a finished product, with on-time delivery. Due to the nature of the optical industry, it is common to have multiple trials before starting mass production, which results in requiring a manufacturing partner with large flexibility in their production capabilities. Our customers often require a quick transition from optical part prototypes to mass production, and Millennium Precision is prepared to meet these needs. We offer an optical parts machine shop capable of production volumes ranging from a single-part rapid prototype up to 100,000-part mass production runs. Additionally, our advanced CNC lathe equipment enables us to deliver customers shorter part delivery lead time, typically often between 2-8 weeks, versus other optical part suppliers. Our Swiss-style CNC lathes, located at our machine shop in Manchester New Hampshire, have multi-axis machining capability, which translates to incredible flexibility in the machined part geometries we can deliver. 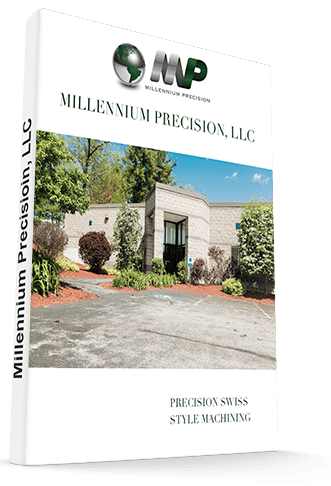 The Millennium Precision machining service is capable of consistently producing parts with tolerances as low as ±0.0001in, accommodating nearly every precision requirement from our customers in the optical industry. Millennium Precision is ISO 9001:2015 certified, which gives our customers in the optical industry confidence that their lathed parts will be thoroughly inspected and documented by our impeccable quality control department. We offer a variety of inventory management services as well to assist our customers in their supply chain divisions. In fact, our customers save valuable time in the documentation on their end due to our stringent documentation standards and inventory management. Millennium Precision has the resources to supply turnkey optical components that require additional services such as heat treating, plating, grinding, polishing, and electroplating. Over the years, we have built a strong network of suppliers in the industry that are always willing to support what our customer needs. Our supplier base is one of the best. Feel free to contact us to see how we can help on your next optical parts manufacturing project.